If you are planning your holidays to La Palma the following information may help by giving you an overview of the island, and help you in selecting from our range of hotels, apartments and villas in La Palma. A holiday in La Palma is not to be confused with Las Palmas – the capital of Gran Canaria, or Palma – the capital of Mallorca. La Palma is one of the three smaller Canary Islands and is the most north-westerly of the archipelago. It has 2 nicknames – La Isla Bonita [the pretty island] and La Isla Verde [the green island]. Beautiful it certainly is, and very green too. La Palma belongs to Spain and lies off the African coast and is on the same latitude as the Sahara. You may not realise it, but when you are on your La Palma holiday, you are holidaying on the worlds steepest island – reaching an altitude of 2,426m on a land base of less then 706km². A volcanic island, La Palmas heart is the Caldera de Taburiente National Park which is an erosion crater 8km wide and 1,500m deep. The walls of this crater can rise to over 2,000m and is crowned by the Roque de los Muchachos. Santa Cruz de La Palma is the capital of the island and is located on the east coast of the island. The next largest resort is Los Llanos de Aridane [sometimes just referred to as Los Llanos] and this is on the western side of La Palma. Probably the most popular natural area people visit on their La Palma holiday is Caldera de Taburiente. A 1, 500m deep and 8km wide crater formed by a giant landslide and resulting erosion. Mountain vegetation and pine forests with many unique flora and fauna species. Visit El Paso [which can be accessed via the Barranco de las Angustias ravine in Los Llanos de Aridane]. There is an impressive view into the crater from the Cumbrecita viewpoint in El Paso and from Roque de los Muchachos. The National Park Visitors Centre is located just above El Paso on the Los Llanos to Santa Cruz de la Palma road. This is open daily from 09:00-14:00 / 16:00-18:30. Another very popular area is Los Tilos which is a deep ravine with lush sub-tropical vegetation. La Palmas largest laurel forest and one of the finest in the Canary Islands, Los Tilos is the centre of the Biosphere Reserve and you can access the Marcos and Cordero springs. Roque de los Muchachos is La Palmas highest peak at 2, 426m and has sparse mountain vegetation and a spectacular view into the Caldera de Taburiente crater. Here you take a look at [although you cant go in] the International Astronomical Observatory [Obervatorio del Roque de los Muchachos – ORM]. The Observatory can, however, be visited on a few Saturdays in the summer months, but bookings must be made well in advance. There are a limited number of places and there are guided tours in groups in different languages. Visits will comprise a detailed explanation in-situ of some telescopes functioning that will last for approximately 2 hours. Corona Holidays can make application on your behalf, but please remember that numbers are very limited and bookings must be made well in advance. The Observatory is home to one of the most extensive fleets of telescopes anywhere in the world, and conditions in La Palma are ideal for night time observations. The Observatory has introduced a service to people on their La Palma holiday, whereby they bring telescopes to various hotels around the island – for example the Hacienda San Jorge has a terrace on their roof from where guests are invited to star gaze. The exterior lighting on the island of La Palma and the area of Tenerife directly visible from La Palma is regulated to prevent light pollution. On your La Palma holiday, why not take advantage of many hiking paths [red de senderos] all around the island and witness an incredible variety of contrasting landscapes. The island Government has signposted a network of hiking paths which follow the international norms of the ERA [European Ramblers Association]. On every hiking path on La Palma, you will find painted marks and numbers similar to those used in the rest of the world. With almost 850km of hiking trails, La Palma is a paradise for walkers and caters for all tastes from a gentle stroll to a strenuous hike. GR [Senderos Gran Recorrido] – long distance [several-day] hiking paths marked in red. La Palma has 2 of these paths which are number 130 and 131. GR 130 is the coastal footpath going around La Palma and through the main villages, but avoiding height differences. GR 131 links two important hiking routes – Ruta de los Volcanes [The Volcano Route] and Ruta de la Criteria [The Summit Route]. PR [Senderos Pequeño Recorrido] – short [1 day] hiking paths marked in yellow. La Palma has 20 main short-distance hiking paths and 18 secondary ones. Their identification will be, for example, PR LP 18 [the LP stands for La Palma]. SL [Senderos Locales] – local paths which are less than 10km in length are marked in green. These paths are used as links between more demanding routes or as short paths. Their identification includes the municipality they belong to. For example, SL FU 112 is a local path in Fuencaliente, SL BL 40 is a local path in Barlovento. 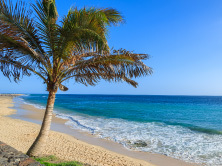 Temperatures in the Canary Islands rarely fall below 20°C in winter and 25°C in summer and La Palma is no exception with an average of 10 hours of sunshine a day in the summer – in fact is it said that the sun shines somewhere on La Palma almost every day of the year. June, July and August temperature can reach 30°C although the heat is manageable thanks to the fresh winds that cool the coast. In winter, the sun tends not to “beat down” making it a popular time for hikers and ramblers to visit. The south of the island is warm and dry while the north of La Palma tends to attract more rain, producing lush forests and meadows. The Cumbre acts as a weather divide and is a natural barrier to the northeast trade winds. Eating our on your holiday to La Palma will be cheaper than on any of the other Canary islands, with prices tending to be approximately half that of Tenerife.Gofio – Gofio is a type of flour made from cereals toasted before they are milled. Very nutritious, it can be found in the milk given to Palmeran children as well on every household table. It is used in many different ways: escacho uses gofio, potatoes, white cheese, green pepper, onions, oregano and salt, escaldado with warm vegetable stock and chicharrones which is fried pork scratchings covered in gofio. These are the most famous appetizers you will find when you are on your holiday in La Palma. Papas Arrugadas – [wrinkly potatoes] these are small potatoes boiled in their skins in extra salty water. They are served with grilled meat and fried fish. Originally, this way of cooking was devised in order to save fresh water. Fish – Some species of fish are fried whereas others are boiled or even grilled. Mojos – Dont let your La Palma holiday come to an end without trying the famous mojos – a spicy traditional sauce made of dried red or green bell pepper. There are two varieties mojo colorado [red pepper sauce] and mojo verde [green pepper sauce]. The custom of adding mojo to dishes dates back to ancient times and is made from dried red or green pepper, oil, vinegar, garlic, salt and cumin. You would use mojo colorado with meat and mojo verde with fish. Less well known are mojo de queso [made from smoked fresh cheese, pepper, garlic and salt and is mainly used to accompany boiled potatoes and occasionally as sauce in salads, and mojo de cilantro [made from coriander, pepper, oil, vinegar and garlic. Yam – Yams are cultivated in San Andrés and Los Sauces and are eaten all over La Palma – mainly with vegetable stew. Desserts and Confectionery – As La Palma was once home to sugar cane plantations, the islanders are known for their sweet tooth and therefore desserts and confectionery are one of the greatest treasures of the island. The sugar was once used in the manufacture of honey and rum but due to the closing down of these industries, an alternative use of the sugar needed to be found and a selection of desserts, cakes, marmalades, jams and doughnuts were made. Also, with an abundance of almonds on La Palma, their use in cakes and desserts was encouraged. Rapaduras are the most famous and traditional confectionery found in La Palma. These are cones made of molasses, gofio, sugar, almonds, cinnamon and lemon. There are other varieties which use milk, chocolate, coconut and eggs. You will find the following treats available in shops, restaurants and markets on your holiday to La Palma. Almendrados is a biscuit made of almonds, sugar and eggs and are baked in the oven. Bienmesabe which is a paste made of ground almonds, sugar and grated lemon rind. Marquesotes is made of corn flour, eggs and sugar which are either sprinkled with syrup or covered with whisked egg whites. Pan de leche made from flour, curd, sugar, eggs, cinnamon, grated lemon rind and a small amount of wine. Queso de almendras, made from eggs, grated lemon rind, cinnamon and almonds. Restaurants will also serve their own desserts which may include Tarta de limón [lemon tart], Principe Alberto [mousse made of chocolate, almonds and sponge, and flanes or quesillos [crème caramel]. Cheese – The Palmeran guarantee of origin regulatory board for cheeses decides on how cheese from La Palma had to be made. It must be handmade from goats milk and it must have a mild, smooth and fatty flavour. La Palmas most cured cheese is normally used in one of the most traditional dishes of the island – queso asado con mojo – grilled cheese with mojo sauce. Honey – La Palma is a paradise for bees and it is home to a wide variety of flora which produce many different varieties of honey with different flavours and scents. So perhaps a jar of honey would be an ideal souvenir of your La Palma holiday. Wine – There are three distinct areas for wine cultivation: Hoyo de Mazo, Fuencaliente and finally the north of La Palma. Each area produces wines which are guaranteed by the Denominación de Origen Vinos de La Palma. Vineyards have had to adapted to the unusual volcanic soils which has only been possible due to the hard work and perseverance of the people of La Palma. Liqueurs – Eau-de-vie, especially the clear brandy distilled from sugar cane, is used to make a variety of liqueurs. Tazacorte is famous for its licor de café [coffee liqueur] which can be made of brandy, sugar, ground coffee and syrup. Mistela is La Palma’s most famous liqueur made from the peel of local oranges. 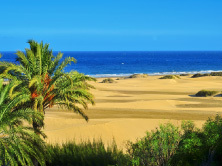 It’s fair to say that La Palma isn’t your run-of-the-mill beach resort, and unlike some of its neighbours, it isn’t blessed with mile upon mile of golden sands. The coastline tends to be quite wild and rugged. 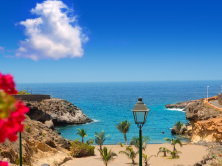 However, that’s not to say you can’t unfurl your beach towel and soak up the sun on your holidays to La Palma. You’ll find hideaway coves tucked here and there, and there are some good sandy beaches too. Most of these are concentrated around Puerto Naos, Puerto de Tazacorte and Los Cancajos, as well as in Breña Alta which can be found to the south of the capital Santa Cruz de la Palma. 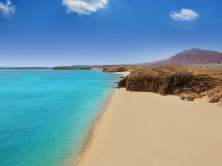 However, the more developed beaches are at Los Cancajos and Puerto Naos, both of which have been Blue Flag beaches for a few years. 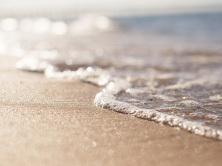 [A Blue Flag beach is the highest European award in matters of beach quality and assures visitors these beaches not only offer clean water, but also provide changing facilities, toilets, showers and first aid posts and are adapted for the disabled]. If black sand beaches are not really for you on your holiday to La Palma, then head to seawater swimming pools which have been hewn out of the cliffs at La Fajana in Barlovento and Charco Azul in San Andrés/Los Sauces. There is also a nudist beach – Playa de las Monjas – which is located to the south of Puerto Naos on the west coast of La Palma. You must take care when swimming in the Atlantic and pay special attention to the flags. If there is a red flat flying then do not go into the sea and only swim with utmost caution when you see a yellow flag flying. La Palma is a bit of a hit with the diving fraternity. During the summer months the ocean is pleasantly calm and clear, as well as being rich in aquatic life, and the southern resort of Fuencaliente is a favourite scuba haunt. It’s worth remembering that the sea can get choppy in the wintertime; so keep an eye on the flat warning systems. No La Palma holiday would be complete without exploring at least part of the island. La Palma has a well planned road network and you can explore the island relatively easily in a hired car, by taxi, or by bus. Buses [guaguas] – The more important towns are connected by public buses. Timetables and route plans are available from Tourist Offices and Transportes Insular offices in Santa Cruz de La Palma and Los Llanos de Aridane. Multi-journey tickets are sold at newsagents, tobacconists and bookshops. Single-journey tickets are issued by bus drivers, but remember to have the necessary change ready! Taxis – There are 3 different rates: 1. Within towns 2. Other destinations – outward journey and return [ida y vuelta] 3. Other destinations – outwards journey only [solo ida]. Taxis can be found at the ranks [paradas]. Traffic Regulations – The legal speed limit for cars is 50kph within towns, and 90kph on open roads and 100kp on highways. It is compulsory for everyone in the vehicle to wear seat belts and the use of mobile phones while driving is forbidden. When you stop at a petrol station, you will need to turn off the engine, turn off the lights and the stereo/radio and you cannot make a phone call on your mobile phone when filling up. Shopping malls, hypermarkets and big department stores are more or loss non-existent in La Palma, but this is all part of the charm of La Palma holidays. Of course, there are some shops and the main ones tend to be clustered in and around Santa Cruz and Los Llanos de Aridane. 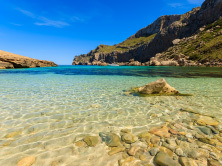 You will find a few souvenir shops and a supermarket or two where you can get your hands on all of those holiday essentials like sun-cream, postcards and bottled water. Shops tend to be closed on a Sunday – sometimes on a Monday; although restaurants remain open. So where do the locals go for their shopping? They tend to disappear to the north of Tenerife to Puerto de la Cruz. For an authentic La Palma shopping experience you need to head up to the sleepy workshops and handicraft stalls selling traditional Canarian items like embroidery, lace and pottery decorated in geometric patterns. La Palma is also famous for its cigars – puros palmeros – made in the town of Mazo. They may not be as famous as Cuban cigars but their quality and flavour is such that they are purchased for Spanish Royal Court in Madrid. conquistadores planted enormous sugar-cane plantations in the areas of Los Llanos de Aridane and Tazacorte. The haciendas in the west were irrigated with water from the Caldera and those in the east by the Marcos and Cordero springs in Los Tilos. Sugar export brought La Palma great wealth but when the sugar market crashed, the island turned into the peaceful island it is today. After sugar came the exporting of wine, silk, embroidery, cigars and dye from the cochineal beetle – all of which brought the large land owners and merchants short term profit, but eventually various natural disasters brought this to an end. Anyone going on a La Palma holiday cannot help but notice that crafts are a way of life and you will be able to see craft displays, see some of the techniques and buy some craft products and souvenirs of your holiday to La Palma. Pottery is a good example, where clay is used to make bowls and other items for daily use. Incisions are made into the clay for decoration and the firing technique turns them black. The first industry on La Palma was sugar-cane plantations, but when this died out, silk manufacture became popular with the larger land owners. The craft arrived on La Palma in 1493 from Portugal and Andalucia. Since this time, the production of silk on La Palma has not changed at all. There is a 12-step process from breeding silkworms to the final article and all this is still carried out by hand – making silk manufacture in La Palma unique. The looms used date back to the 18th century and fabric is dyed using natural substances such as almond shells, onion peel, saffron and cochineal. Embroidery plays an important part in La Palma crafts and is applied to traditional costumes, tablecloths and church decorations. Of all the crafts, embroidery has always been an important source of income for many families. Richelieu or rechi : this is embroidered on a white or beige cloth and is characterised by its loops which once cut, give the whole cloth an elegant appearance. Realce : this is embossed embroidery with straight or oblique stitches. It is used to embroider flowers, leaves and letters. Punto perdido : this is different stitches, one over the other, which makes different colour tones and forms flowers. One of the oldest handicrafts you will find on your La Palma holiday is basket making. Bags, moulds for cheese, hats and fans used to revive fires are traditional items made of palm leaves. Peeled wicker is use to make more delicate items like sewing boxes and baby baskets. Stronger baskets used to carry grapes, stones, potatoes are made from a mix of cane and wicker. Cane is also used in the making of bird cages of different shapes and sizes. towards San Pedro. When you get to Los Llanitos take the uproad hill leading to San Isidro [San Isidro is very close to Breña Baja]. The notices of Finca Tabaquera el Sitio will be easily seen. 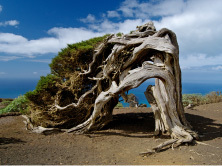 A holiday in La Palma means a holiday on an island rich in legends which have been passed down through the generations. From impossible loves, volcanic powers, twins in search of their unique being, to images of the Virgin Mary, we have detailed two of the best known legends below. persistence she decided to give him a test. She announced that if the young shepherd wanted to marry her, he had to go to the edge of the cliff and perform a risky manoeuvre three times. He had to hold his long shepherds crook with both hands, thrust it into the ground close to the edge and swing across the void. The shepherd accepted the challenge and on the first attempt he swung himself over the edge shouting “In the name of God!” and landed safely with both feet on the ground. The second time when he swung himself over the edge, he shouted “In the name of the Virgin Mary!” and again he landed safely. He swung for the third time shouting “In the name of my love!”. At that moment, whilst his voice was echoing around the ravines, the heavens decided to punish him for calling on a mere human in a moment of such peril. When the shepherd tried to land the edge of the cliff crumbled away, sending him falling down to the waves below crashing on the rocks. Ever since then, they have called the crag “Salto del Enamorado”. [The Lovers Leap]. Robertos Wall – The older inhabitants of La Palma tell of a young man from the district of Tijarafe who was in love with a woman from the district of Aceró in the national park of the Caldera de Taburiente. One night, when they were going to meet in secret, they were astonished to find that the Devil had built a wall across the path between them. The young man tried to cross the wall, but was unable to do so. He shouted twice “Ill give my soul if I can cross this wall”. After a moment of silence, he shouted “Ill give my soul and my body if I can pass”. At that moment flames from Hell rose out of the ground and the young man, engulfed in a ball of fire, smashed through the wall and rolled down a deep ravine. The young lady was found dead early in the morning and the shepherds buried her at Roque de Los Muchachos. On her tombstone grew Palmeran violets with flowers as blue as her eyes. The wall in this legend can still be found today, split in two with a footpath running through the gap. According to the legend, the break in the wall was made by the young man in his passion to be with his beloved. La Palma mainly thrives from agriculture and from banana growing in particular [which was introduced by the English at the end of the 19th century]. Today, the banana plantations occupy around 3,000 hectares and almost the entire coastal strip in the south and west of La Palma and extend up to a medium altitude in the Aridane Valley. Approximately 140,000 tonnes of bananas are exported every year along with wine, potatoes, oranges, avocados, mangos and papayas. 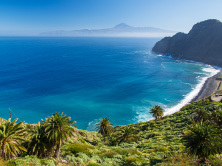 Tourism is slowly developing in La Palma and sustainable tourism is being invested in, and UNESCO has declared the whole island as a Biosphere Reserve.